Underscoring just how critical it is to check OEM repair procedures every time, every vehicle, the asTech director of calibrations last week described three different types of Mazda blind-spot monitoring sensors found within the past few model years. The three systems all are described the same to the vehicle owner by Mazda and seem to behave identically from a driver’s perspective, Repairify CEO Doug Kelly, whose company produces the asTech, told a VeriFacts Guild 21 call on Thursday. “To the customer, it’s all the same,” asTech director of calibrations Bram Paris agreed on the call. He said they’re all called “Blind Spot Monitoring” and are part of the Mazda i-ACTIVSENSE system. It won’t be obvious from looking at the vehicle which one a customer had, and repairers need to be aware of the different systems’ existence, Kelly said. “They do definitely work different,” Paris said. Version 1 was found in “early builds” — Mazdas sometime before 2016, according to Paris. He said he wasn’t sure of the exact year but noted that other types of advanced driver assistance systems began appearing in 2008. The industry is still trying to wrap its head around calibration, but as Paris noted, it actually needed to have been done “all along.” The average repairable vehicle is only 6 years old, and the average car on the road is only 11.6 years old. Paris said the first Mazda blind-spot monitors only checked “small” sensing areas — about 23 feet, not much larger than a car — and was “not as smart” as later editions. It only knows “something’s there”; it can’t tell if the vehicle is entering or exiting the blind spot, he said. A shop uses a reflector to recalibrate the sensor, according to Paris — and he noted that Mazda demands recalibration any time the bumper is removed. Mazda calls this a “radar test,” Paris said, later noting that Mazda’s system doesn’t technically get recalibrated the way other OEM tech might be. Roughly speaking, other technologies teach the car where it is in relation to the environment — and “it’s not going to warn you” if the target is in the wrong location, according to Paris. Mazda’s blind-spot calibration just looks at a fixed point to verify the sensor is detecting something there, based on how he described it. If the system fails the test, it’s probably related to the sensor or bracket mounting area, Paris said. “You’re not really changing what the sensor does,” Paris said. Paris called the second advanced blind-spot system “the interesting one.” He said it can be found on the 2016-18 CX-3 and MX-5 Miata. It appears as though it might be on some Mazda6s as well. Paris said asTech didn’t know if Mazda would extend this technology to future model years. Version 2 has a “significantly larger” detection area of 164 feet, which makes “a huge difference” in what a driver can be warned about. 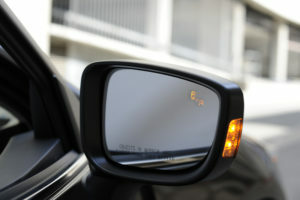 It also can tell if the vehicle in the blind spot was entering or exiting the space and monitor the speed of both cars. Recalibration requires a device known as a “doppler simulator” — a device so far only used on the CX-3 and Miata blind spot monitors, according to Paris. It simulates the existence of a vehicle in the blind spot. Paris said the doppler simulator costs “a few thousand dollars,” and as far as he knew, dealers “basically rent the tool” — they can’t buy it. A Mazda dealership can check out the doppler simulator for two days and must pay a penalty if they don’t return it on time, he said. “I was very surprised” at the system, Paris said. Finally, Version 3 appeared on the 2016 CX-9 and future models, according to the presentation (see slides). It has the same range and capabilities as Version 2, but it calibrates with “exactly the same” reflector and “very similar setup proedures” as the old Version 1, according to Paris. The next Guild 21 call is scheduled for April 12 at 2 p.m.